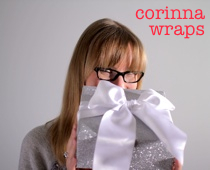 Have you started thinking about wrapping your holiday gifts yet? Well, look no further for inspiration. I’m thrilled to join the Scotch Brand team as a guest pinner on their Gift Styling Ideas for the Holidays board on Pinterest. Included on the board are four DIY wrapping projects that I created exclusively for Scotch Brand, plus you’ll find lots of other inspiring ideas — and more to come!